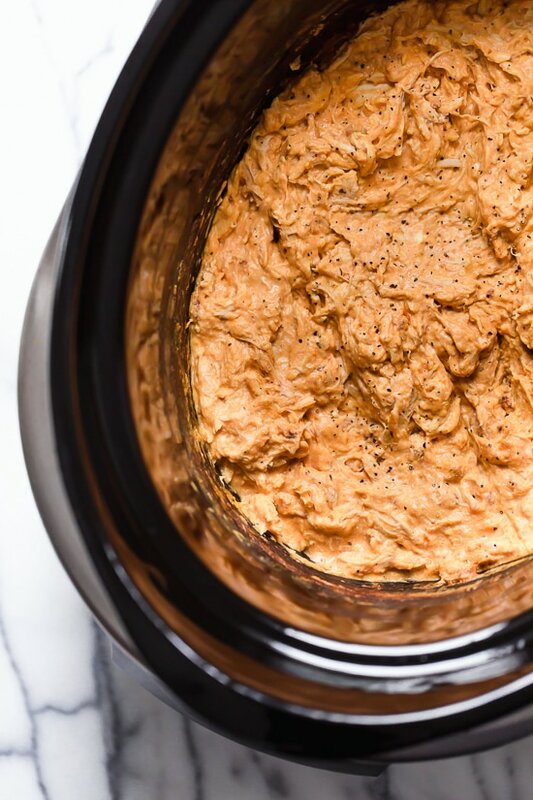 This Slow Cooker Buffalo Chicken Dip has everything you love about buffalo wings, only made into a dip – no messy hands! It’s perfect for sharing with friends and a must for your Superbowl party!! A few more favorite party appetizers are my Mini Bell Peppers Loaded Turkey “Nachos”, Hot Spinach and Artichoke Dip, and Baked Buffalo Chicken Jalapeño Poppers. 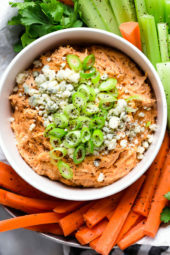 I’ve been making this buffalo dip for years because it’s always a hit when I serve it at any party. 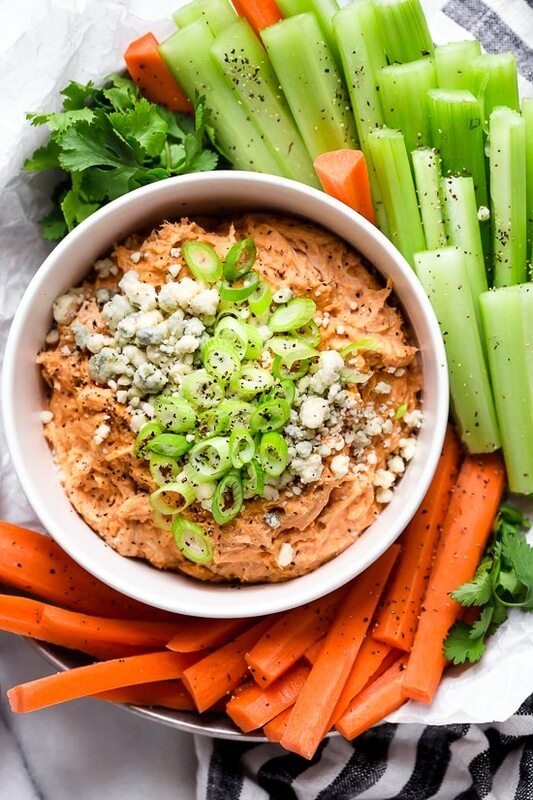 It’s much lighter than most buffalo dip recipes out there, but you would never know! I first published this back in 2010, so this really needed some new photos to bring this recipe back to life! 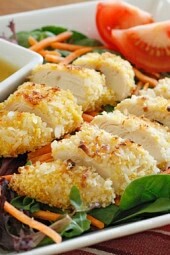 Serve it with celery, carrots, chips or crackers. If you are planning on serving a larger crowd, I highly recommend doubling the recipe, the cook time will remain the same. To bake this in the oven, you can use cooked shredded chicken breast from a rotisserie chicken, then mix all the ingredients and place them in a baking dish. Bake 350F until hot, about 20 to 25 minutes. And since so many are asking, although I have and love my Instant Pot, I still love my slow cooker! I have the 6 Quart Hamilton Beach Set ‘n Forget Programmable Slow Cooker (affil link). I love it because you can adjust the time you want it to cook, and it automatically turns to warm when it’s done. It also has a probe for meat that automatically shuts off when done. I hated my old crock pot, it burnt everything and my food had a weird taste. This slow cooker is so great, I actually own several! 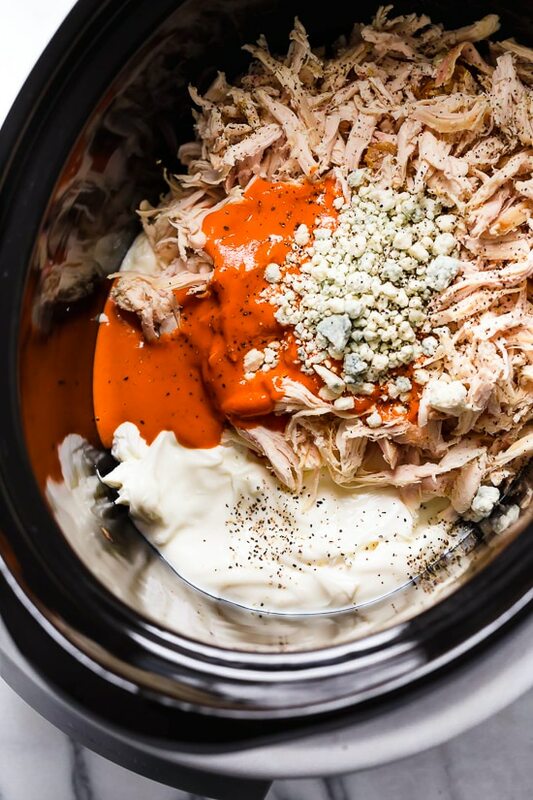 To make the shredded chicken, place chicken in the slow cooker and add enough water or chicken broth to cover. Cook high 4 hours. Remove and shred with two forks, discard the liquid. Meanwhile, combine the cream cheese, sour cream, vinegar and hot sauce together until smooth. Add half of the blue cheese. Transfer to the slow cooker with the chicken, mixing well and return to the slow cooker, cook low 2 to 3 hours. Transfer to a serving dish and top with the remaining blue cheese, garnish with scallions. Serve hot. Cook chicken covered in water or broth 15 min high pressure. Once you shred and drain set the instant pot to the slow cooker mode, combine ingredients and proceed. Looks delicious! Can this be made with frozen chicken breast? If so, should I cook longer? Thanks for all you do! We love your recipes! Hi, does the chicken have to be in the slow cooker for 4 hours before i add the cream cheese sauce? and then cook for a further 2-3 hours? I love this recipe. I’ve made it the first time with sour cream and the second time with nonfat Greek yogurt and couldn’t tell a difference. 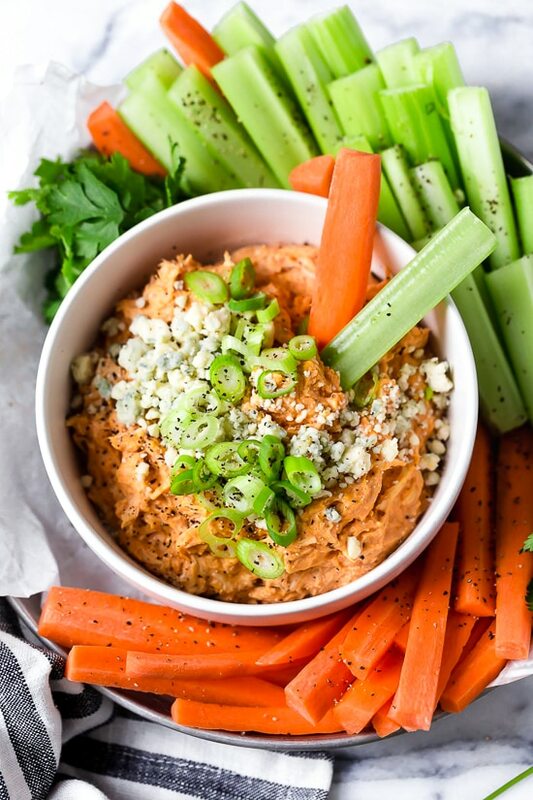 Its great as dip and also delicious in a wrap with celery, scallions, and cheddar cheese!! It tastes like the real thing – no reason now to eat the unhealthy version! Has anyone put these ingredients together in a baking dish including the cooked chicken, and kept in the fridge over night and baked it the following afternoon? I made this for Super Bowl Sunday, and it is absolutely fantastic! I made it exactly as instructed and it turned out perfect. My husband doesn’t even like buffalo wings, but he loved this dip. Thank you so much! I baked this in the oven for 20 minutes and used the rotisserie chicken. It was quite tasty and my husband also loved it! Thank you for this recipe! I made this last night to host Bunco, and it was a huge hut! Most eaten item! I had a couple of servings myself and it didnt break my WW bank! Thank you! What do you do with the vinegar? I read the recipe through a couple times, but didn’t see it referenced in any of the steps? Add along with the dairy and sauce. Can this be made in the instant pot?? Cook chicken covered in water or broth 15 min high pressure. Once you shred and drain set the instant pot the the slow cooker mode and proceed. For the amount of chicken, do you mean 2 chicken breasts that are 16 oz EACH or 2 chicken breasts that are 16 oz TOTAL? This is my question too! I am planning to make this for superbowl this year and want to make sure the portions are correct. Amazing! I didn’t have time to slow cook the chicken so I put it in the instant pot, covered with water, manual 15 minutes with natural release. Removed chicken, shredded it, dumped the water, added the other ingredients in the pot, put shredded chicken back in, switched it to slow cook function for about an hour and it was perfect. Advice for someone who does’ t like bleu cheese? You can use cheddar cheese or any cheese, really. This recipe sounds great. But where do you find fat free cream cheese? I haven’t seen it for a couple of years. When do you use the white vinegar. It is not mentioned in the directions. I would guess in step 2 with the other wet ingredients. I’m confused about how long to cook it. At the top, it says total time is 4 hours, but when I read the directions, it sounds like 6-7 hours. At what point should we add the other ingredients to the chicken, before or after shredding? It looks delicious, and I really want to make it! Depends on the method– 25 minutes cook time in the oven with pre-cooked chicken or total for crock pot will be about 6 hours. Made this today. Doubled the recipe and Followed it exactly as shown. Delicious! Cannot even tell it’s low fat or miss it! Thanks for great recipes! I made a variation of this. I used greek yogurt instead of sour cream, i also used fat free cottage cheese (blended) instead of cream cheese. I also threw in a package of ranch seasoning. OMG SO good!! Glad this was able post inspired me to make a few modifications. What are the freestyle points for this? All smart points have been updated to reflect the free style program. Made with FF greek yogurt on the stovetop and it was awesome. Used 1/2 cup as a serving size (couldn’t stop myself at 1/3 cup) and it was 3 points. Yay! 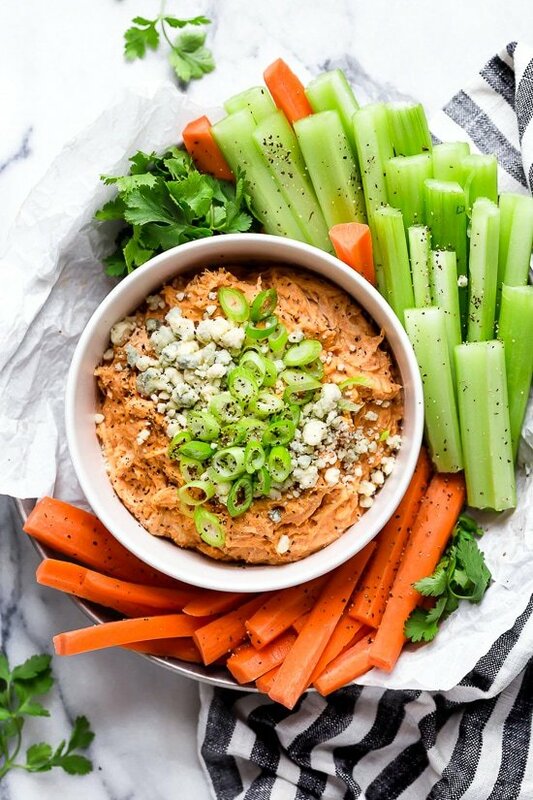 Buffalo Chicken Dip is now on my list of weight watchers friendly foods! This is my husband’s favorite dip! So good for football parties – such a big hit with everyone and so many compliments every time! Made this for a Super Bowl party and it was fantastic. No one could ever know this was a lighter version. 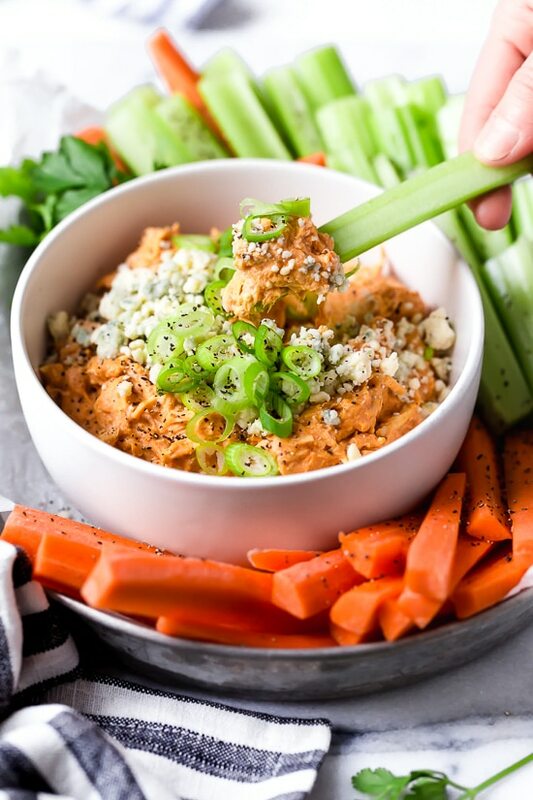 I was a bit skeptical of this one since I’ve made a version of buffalo chicken dip for years and always make it for parties and bring it to parties – the crowd always loves it. I was a bit iffy on a “skinny” version of it but as usual, Gina did not let me down. This was just as delicious as the “full fat” version. My kids ate it up too and didn’t even notice the difference! YUM! Just made this last night – in the microwave! I used canned chicken just to see how it would work. Turned out perfectly delicious. So quick to make. Anyone know if you can make this in the Instant Pot? Can you adapt this recipe for the Instant Pot? Thank you! Great idea, I’ll do that soon! How long do you proceed in slow cooker mode for? Do you add the chicken in raw with all the ingredients and let sit? Or does the chicken need to be cooked first, shredded and then added? I replaced the sour cream with Fage 0% plain Greek Yogurt (higher protein content than sour cream), but kept everything else the same and it tastes amazing! Thanks a ton! Did you figure points for this edit? HI what do people like to serve this with the best? I am taking to a neighborhood party. Should I do tortillas and celery? Am I putting cooked or raw chicken in the crockpot for 3-4 hours? 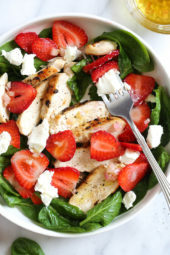 A way to make it even healthier….swap out the sour cream for greek yogurt! Still delicious! I’ve made this recipe so many times now. It’s really good. I have a question can I cook this in the oven. I plan to prepare everything per usual but don”t want to cook in the crockpot or stove top. I want to put it in a baking pan the night before and stick it in the oven the next evening. What do you think? Would it come out the same? Would love to know…as per Brandy’s inquiry…if this is ‘do-able’ in the oven?! No crockpot …alas!!! yes see above the recipe, I tell you how to make it! We are not fans of bleu cheese, so I use feta cheese. Do you really taste the bleu cheese? Not a fan of it. Would this work better with a feta substitute or cheddar cheese? You can use cheddar instead. Should the chicken be cook and shredded prior to adding it to the recipe? Hi Gina! Could this be done in Instant Pot? If so would we follow the instructions but just use the poultry setting for 7 minutes? By the way…made your Salsa Verde enchiladas tonight…my picky eaters had seconds…they were excellent! Thanks! Pingback: 21 Crowd-Pleasing Dip Recipes- Great Appetizers for Parties! I have made this twice, once with canned chicken and once with chicken I poached (doubled the recipe both times, too). Soooo good either way. This is going to be my go to party dip! 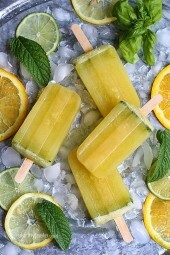 I’m thinking of making this today for a party tomorrow! How would you recommend making it (heating it or reheating it?) to bring to a friends house tomorrow? THANK YOU SO MUCH FOR RESPONDING !!! Do you think this could be microwaved to heat if bringing to a party? thanks! This recipe was absolutely delicious. I was slightly woosie on the hot sauce but it is definitely an awesome recipe! Hi, do I need to cook the chicken, before I put in crockpot? Can I just use white vinegar instead of white wine vinegar? If I double the recipe, how much longer should I leave it in the crockpot for? I would list the insane level of sodium in this to warn everyone that while it's more healthy than the traditional full-fat recipe, the sodium content of this is still super super high! Could I substitute plain non fat greek yogurt for the sour cream? Wanting to make this for a party I'm going to tomorrow so I hope this isn't a stupid question! Am I putting COOKED chicken in the crock pot with all the other ingredients? Or does the chicken go in raw? This dip is the BOMB. I've made it twice and everyone loves it. I made it exactly like the recipe provided. It is soooooooooo yummy. I cooked mine stove top for 30 minutes because I didn't feel like taking the crockpot out. I made this today and I must say, it is very delicious. I am a very picky eater, and I won't eat food that I do not like. That's what I love about Weight Watchers, you can pretty much eat anything you want within your allotted points and still lose weight. Lastly, this recipe is so versatile, you can use it in other recipes or even create a recipe with it. Can this be frozen? Made a batch for a meeting but we had so much food that I have a bunch leftover. I'd love to save it for the Super Bowl – and to get it out of my frig so it's not tempting me every time I open the frig. I've used this recipe before, and it turned out great! I once doubled it and subbed a low fat chunky bleu cheese dressing as well. I plan on making it again and using it for dip, wraps, salads, and even sandwiches. I'm also going to try to chop part of a yellow or green onion to enhance the flavor. I'm also wondering how it would taste with low fat ranch dressing too. Can you use the Frank's buffalo sauce as opposed to the red hot sauce or does that throw everything off? Another hit from my holiday party! My guests all loved it and kept going back for more. I made this for a party at work today and no one could tell it was a skinny dip. I doubled the recipe and instead of blue cheese I used some chedder cheese. I am from CNY and wing dip is HUGE around here…people are very particular about how they have their wing dip. Everyone liked this. Thanks for your website, I always find great stuff here. Dumb question, but does the chicken need to be cooked and shredded before its mixed with all of the ingredients to cook for 4 hours? Made this dip over the weekend, and it was FANTASTIC!!!!!! My teenage son is begging me to make more!!! Has anyone substituted low fat plain Greek yogurt for the sour cream???? I'm about to make it this way and was wondering if I should have a 'heads up" about the substitution. I just made this but stuffed it in some pablano peppers and sprinkled some cheese on them and then baked it at 350 for an hour. Buffalo chicken stuffed pablanos. Mmmmmm….they were quite tasty! WOW! That's an awesome idea. Anyone ever heat this in a micro? Going to bring it to a party. Cook no but I did warm the whole bowl in the microwave the next day. It taste best warmed. Hi Gina!! Love this dip, I have made it so many times! Can I substitute Greek Yogurt for the sour cream? I have just made it for appetizers for lunch with friends today and I need to stop eating it, before it gets over there and there's none left! So yummy! Do you think it would be okay to replace the fat free sour cream with Greek yogurt? Made this for a Mary Kay party where everyone was watching WW points, and then for the Super Bowl – my husband decided to use THIS as a sandwich filling instead of the Philly cheesesteaks I'd planned! It was that good – I even took it a step further and used reduced fat blue cheese and 0% plain greek yogurt in place of sour cream. I like using rotisserie chicken, it's a lot more chunky that way, too! This is so good!! I had to try hard not to eat as I was preparing it. It was a hit at Superbowl Sunday! Made this last night and it was great. I doubled the recepie that way I could use full containers of cream cheese, sour cream and blue cheese. I like it best with celery. It helps take down some of the 'heat' but it also is much healthier than chips or crackers. I used regular franks red hot but I noticed that franks also makes buffalo sauce. Not sure if that would be better or worse. Only one way to find out! I also baked this in the oven. I put it in at 350 and waited for it to start to bubble. Made this one for a Super Bowl party tonight. It got rave reviews and there were no leftovers. Served with celery and cauliflower, left out the blue cheese (because I forgot to buy any). This will become a regular "football season" recipe. Thank you!! Made this for Super Bowl today. Used Low-fat shredded Mexican Cheese instead of blue. (although hubby loves blue, I think it's yuck) it was so good. I liked it even better than full fat version. Thank you a million times. 2013 Super Bowl post… My fiancé made it! I'm the cook around here typically, but he did fantastic! He did use canned chicken and did the stove top method. It is delicious. So glad I came across your recipes. I share your site with anyone who will listen. Doing great with my weight loss and your meals have been a great helping hand in me reaching my goals. Thanks for making skinny delicious as well. My crockpot cooks WAY too fast regardless of the setting I choose, so I made this in a pretty baking dish and it is in the fridge right now. I HOPE that there will be some left for me to take to the party, but honestly, I keep sneaking bites from the fridge. If it is this good cold, cannot wait to try it all warm and melty!! I love spicy, but not buffalo, so I used Cholula and cheddar cheese and I added some chopped green onions, cumin and a bit of chili powder. In a work, YUM!!! As always Gina, thanks for your awesome recipes!! Hi! You baked yours in the oven? Can you share the details?? In the above comments, Gina tells how to make in the oven???? This is a staple in our house! My husband requests it all the time. It's delicious as written but I like to use light blue cheese dressing to make the consistency a little creamier. Thanks Gina!